This Website is provided only to assist customers in discovering travel information, determining the availability of travel-related goods and services, making legitimate reservations or otherwise transacting business with travel suppliers, and for no other purposes. By accessing or using this Website in any manner, you agree to be bound by the Agreement. As a condition of your use of this Website, you warrant that (i) you are at least 18 years of age, (ii) you possess the legal authority to create a binding legal obligation, (iii) you will use this Website in accordance with this Agreement, (iv) you will only use this Website to make legitimate reservations for you or for another person for whom you are legally authorized to act, (v) all information supplied by you on this Website is true, accurate, current and complete, and (vi) if you have an ExploringMacedonia.com account, you will safeguard your account information and will supervise and be completely responsible for any use of your account by anyone other than you. We retain the right at our sole discretion to deny access to anyone to this Website and the services we offer, at any time and for any reason, including, but not limited to, for violation of this Agreement. You agree to abide by the terms and conditions of purchase imposed by any supplier with whom you elect to deal, including, but not limited to, payment of all amounts when due and compliance with the supplier's rules and restrictions regarding availability and use of fares, products, or services. You acknowledge that some third-party providers offering certain services and/or activities may require you to sign their liability waiver prior to participating in the service and/or activity they offer. You understand that any violation of any such supplier's rules and restrictions may result in cancellation of your reservation(s), in your being denied access to the applicable travel product or services, in your forfeiting any monies paid for such reservation(s), and/or in our debiting your account for any costs we incur as a result of such violation. THE INFORMATION, SOFTWARE, PRODUCTS, AND SERVICES PUBLISHED ON THIS WEBSITE MAY INCLUDE INACCURACIES OR ERRORS, INCLUDING PRICING ERRORS. IN PARTICULAR, EXPLORINGMACEDONIA.COM, AND ITS MEMBERS THROUGH WHOM WE PROVIDE SERVICE (COLLECTIVELY, "EXPLORINGMACEDONIA.COM AFFILIATES") DO NOT GUARANTEE THE ACCURACY OF, AND DISCLAIM ALL LIABILITY FOR ANY ERRORS OR OTHER INACCURACIES RELATING TO THE INFORMATION AND DESCRIPTION OF THE HOTEL, AIR, CAR AND OTHER TRAVEL PRODUCTS DISPLAYED ON THIS WEBSITE (INCLUDING, WITHOUT LIMITATION, THE PRICING, PHOTOGRAPHS, LIST OF HOTEL AMENITIES, GENERAL PRODUCT DESCRIPTIONS, ETC. ), MUCH OF WHICH INFORMATION IS PROVIDED BY THE RESPECTIVE SUPPLIERS. IN ADDITION, EXPLORINGMACEDONIA.COM EXPRESSLY RESERVES THE RIGHT TO CORRECT ANY PRICING ERRORS ON OUR WEBSITE AND/OR ON PENDING RESERVATIONS MADE UNDER AN INCORRECT PRICE. IN SUCH EVENT, WE WILL OFFER YOU THE OPPORTUNITY TO KEEP YOUR PENDING RESERVATION AT THE CORRECT PRICE OR, AT YOUR OPTION, WE WILL CANCEL YOUR RESERVATION WITHOUT PENALTY. HOTEL RATINGS DISPLAYED ON THIS WEBSITE ARE INTENDED AS ONLY GENERAL GUIDELINES, AND THE EXPLORINGMACEDONIA.COM MEMBERS DO NOT GUARANTEE THE ACCURACY OF THE RATINGS. EXPOLORINGMACEDONIA.COM AND ITS MEMBERS MAKE NO GUARANTEES ABOUT THE AVAILABILITY OF SPECIFIC PRODUCTS AND SERVICES. EXPLORINGMACEDONIA.COM, AND ITS RESPECTIVE MEMBERS MAY MAKE IMPROVEMENTS AND/OR CHANGES ON THIS WEBSITE AT ANY TIME. EXPLORINGMACEDONIA.COM AND ITS MEMBERS MAKE NO REPRESENTATIONS ABOUT THE SUITABILITY OF THE INFORMATION, SOFTWARE, PRODUCTS, AND SERVICES CONTAINED ON THIS WEBSITE FOR ANY PURPOSE, AND THE INCLUSION OR OFFERING OF ANY PRODUCTS OR SERVICES ON THIS WEBSITE DOES NOT CONSTITUTE ANY ENDORSEMENT OR RECOMMENDATION OF SUCH PRODUCTS OR SERVICES BY EXPLORINGMACEDONIA.COM. ALL SUCH INFORMATION, SOFTWARE, PRODUCTS, AND SERVICES ARE PROVIDED "AS IS" WITHOUT WARRANTY OF ANY KIND. EXPLORINGMACEDONIA.COM DISCLAIM ALL WARRANTIES AND CONDITIONS THAT THIS WEBSITE, ITS SERVERS OR ANY EMAIL SENT FROM EXPLORINGMACEDONIA.COM ARE FREE OF VIRUSES OR OTHER HARMFUL COMPONENTS. EXPLORINGMACEDONIA.COM DISCLAIM ALL WARRANTIES AND CONDITIONS WITH REGARD TO THIS INFORMATION, SOFTWARE, PRODUCTS, AND SERVICES, INCLUDING ALL IMPLIED WARRANTIES AND CONDITIONS OF MERCHANTABILITY, FITNESS FOR A PARTICULAR PURPOSE, TITLE, AND NONINFRINGEMENT. THE CARRIERS, HOTELS AND OTHER SUPPLIERS PROVIDING TRAVEL OR OTHER SERVICES ON THIS WEBSITE ARE INDEPENDENT CONTRACTORS AND NOT AGENTS OR EMPLOYEES OF EXPLORINGMACEDONIA.COM. EXPLORINGMACEDONIA.COM IS NOT LIABLE FOR THE ACTS, ERRORS, OMISSIONS, REPRESENTATIONS, WARRANTIES, BREACHES OR NEGLIGENCE OF ANY SUCH SUPPLIERS OR FOR ANY PERSONAL INJURIES, DEATH, PROPERTY DAMAGE, OR OTHER DAMAGES OR EXPENSES RESULTING THEREFROM. EXPLORINGMACEDONIA.COM HAS NO LIABILITY AND WILL MAKE NO REFUND IN THE EVENT OF ANY DELAY, CANCELLATION, OVERBOOKING, STRIKE, FORCE MAJEURE OR OTHER CAUSES BEYOND THEIR DIRECT CONTROL, AND THEY HAVE NO RESPONSIBILITY FOR ANY ADDITIONAL EXPENSE, OMISSIONS, DELAYS, RE-ROUTING OR ACTS OF ANY GOVERNMENT OR AUTHORITY. Any software that is made available to download from this Website ("Software") is the copyrighted work of ExploringMacedonia.com. Your use of such Software is governed by the terms of the end user license agreement, if any, which accompanies, or is included with, the Software ("License Agreement"). You may not install or use any Software that is accompanied by or includes a License Agreement unless you first agree to the License Agreement terms. For any Software made available for download on this Website not accompanied by a License Agreement, we hereby grant to you, the user, a limited, personal, nontransferable license to use the Software for viewing and otherwise using this Website in accordance with these terms and conditions and for no other purpose. Please note that all Software, including, without limitation, all HTML code and Active X controls contained on this Website, is owned by the ExploringMacedonia.com and is protected by copyright laws and international treaty provisions. Any reproduction or redistribution of the Software is expressly prohibited, and may result in severe civil and criminal penalties. Violators will be prosecuted to the maximum extent possible. Currency rates are based on various publicly available sources and should be used as guidelines only. Rates are not verified as accurate, and actual rates may vary. Currency quotes are not updated every day. Check the date on the currency converter feature for the day that currency was last updated. 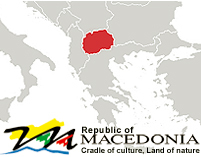 The information supplied by this application is believed to be accurate, but ExploringMacedonia.com doesn’t warrant or guarantee such accuracy. When using this information for any financial purpose, we advise you to consult a qualified professional to verify the accuracy of the currency rates. We do not authorize the use of this information for any purpose other than your personal use and you are expressly prohibited from the resale, redistribution, and use of this information for commercial purposes. All contents of this Website are: ©2007ExploringMacedonia.com. All rights reserved. ExploringMacedonia.com is not responsible for content on websites operated by parties other than ExploringMacedonia.com. Other logos and product and company names mentioned herein may be the trademarks of their respective owners. This Website is operated by a Macedonian entity and this Agreement is governed by the laws of the Republic of Macedonia. You hereby consent to the exclusive jurisdiction and venue of courts in Skopje, Republic of Macedonia, in all disputes arising out of or relating to the use of this Website. Use of this Website is unauthorized in any jurisdiction that does not give effect to all provisions of these terms and conditions, including, without limitation, this paragraph. You agree that no joint venture, partnership, or employment relationship exists between you and the ExploringMacedonia.com Companies as a result of this Agreement or use of this Website. ©2007 ExploringMacedonia.com. All rights reserved.